One call to us does it all for our customers, if that is what they desire. 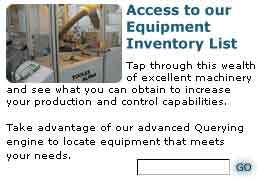 We can supply entire lines, single machines, installation, spare parts, advice, or even a single screw if necessary. Between the Czech Republic and the United States, we have the largest inventory of spare parts worldwide. Dometek will even contract with our customers to perform long term support of equipment purchased from us, or similar equipment. We are the one company that can design the factory floor, provide equipment and peripheral equipment, provide installation of equipment and training to staff and continue to service the equipment on a long term basis. No other pre-owned equipment supplier can provide the seamless service that Dometek can; Dometek is truly a turn key company.